I am always watching for simple everyday looks. An outfit that works for a walk in the mall, grocery shopping, or lunch with girlfriends. Real world stuff. Nothing beats the casual and put-together look of a crisp white top and jeans. A quick change of shoes takes the combination from casual to outdoor café chic. I know that skinny jeans are today's look but I have leg-fitting issues, so I stick with boot cute. Jean in all varieties seem to never go out of style and will not break the bank. Sure you can pay $450 for Nortdstom's designer jeans or pay $29.00 for Macy's Style&Co. Your choice. The great thing about jeans; jeans are jeans. Paired with the right white top, stripe or solid t-shirt you can still look feminine. Dressing Hack: I always carry/take a second pair of shoes. After a lunch or meeting where I wear heels, I will slip on a pair of flats or low heels to run by the mall, before heading home. My feet always thank me. Susan over at Susan After 60 always has wonderful advice and showcases great looks. I hope you read and study her blog that is a permanent link on my site. I found this photo of Susan on Pinterest and I believe it to be a few years ago. Susan's hair is a little shorter today. 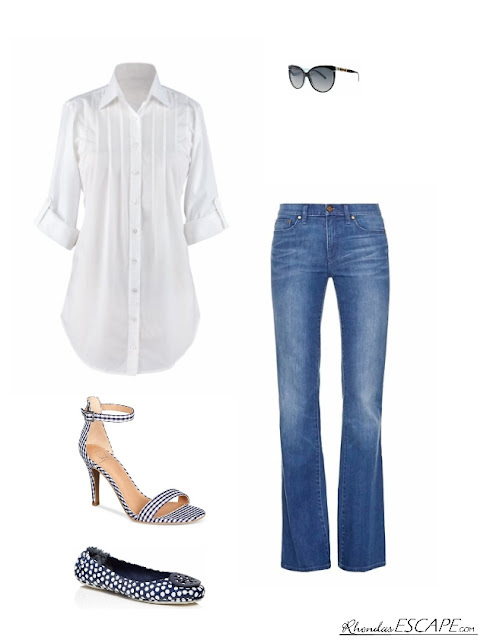 My point, this look of a white tunic top and jeans with heels, looks so “put-together”. Thank you Susan for your wonderful advice and being a friend. Give it a try. I do utilize this look and it works every time. I feel confident and that is the goal. A simple, "this works” outfit. You never have to over-do. Simplicity Wins!